The 287 yard 1st is a semi-blind tee shot with deep rough and trees on both sides. About 60 Yds short of the green is a ditch across the fairway, so a driver can be dangerous choice! 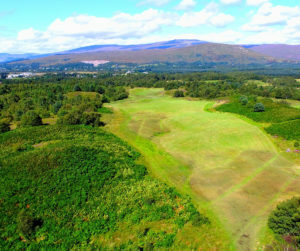 The 2nd is a par 4, with very deep rough on both sides of a wide fairway. 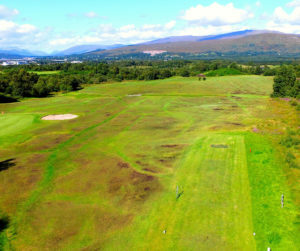 Bunkers on the left and right of the green mean an accurate 2nd shot is required. But don’t rest yet, as the green has a few “sliders” to content with…..a birdie here is well earned. 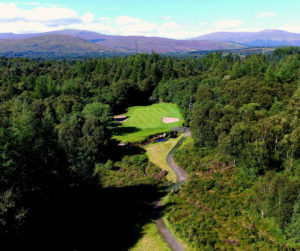 Although this hole has a wide fairway, into the prevailing west wind this 393 yard par four or 566 yard par five from the white box is a toughie. Avoid the long rough down the left hand side. Hole five is a par 4, 385 yards from the yellow boxes and stroke index #1. Trouble left and right from tee to green. A high score here is not uncommon, even for the low handicapper. 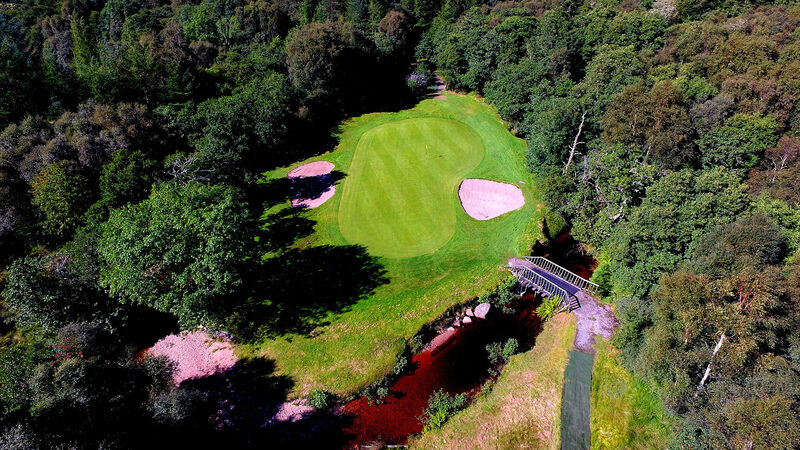 482yards and a par 5 from the white box, just to add a little bit more flavour! 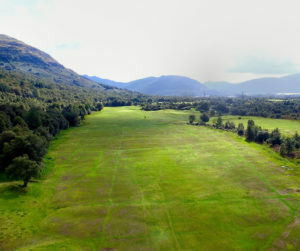 The green slopes right to left, and rewards the high floating approach shot. 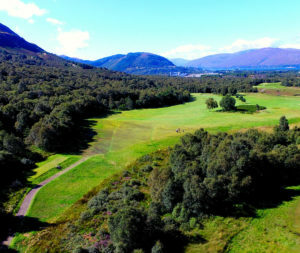 The 6th at Fort William is one of the finest par 3s in Scotland. 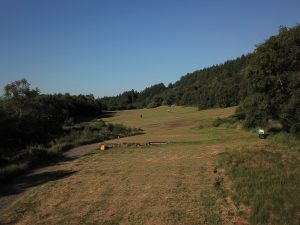 Although a short hole measuring only 125 yards, it is very testing with heavy rough from the front of the tee. The green is surrounded by a 15 foot burn with a bunker on either side and heavy rough and trees through the back. Hole seven is 336 yards from the yellow box and a 464-yard par 4 from the white. This hole has the most challenging green on the course. A par on this hole from the white box is quite an achievement. A par four of 372 yards the eighth has two ditches you have to cross before you reach the green. Not much trouble around this large green apart from a bunker on the left side. Hole nine is a 401 yard par 4 from the yellow box and a 527 yard par 5 from the white. 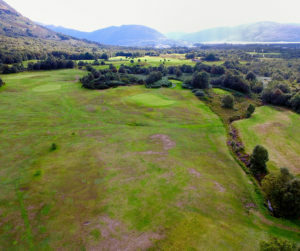 A right-handed slight dogleg requiring a good shot into a large green with a few very deceptive borrows. Trouble awaits down the left and right hand sides……..not again! 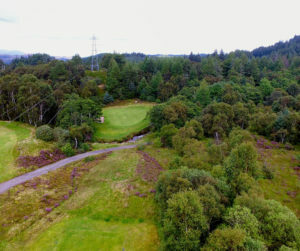 Par 5 from the white box measuring some 479 yards, and a par 4 measuring 377yards from the yellow. 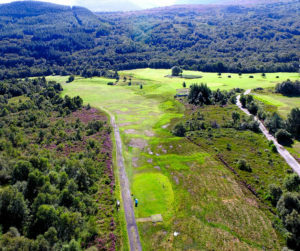 A very open fairway with large elevated green, but watch out for the hazard all along the left hand side! Arguably the best golfing hole on the course. 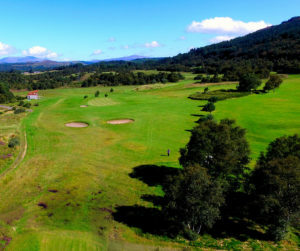 At index 2, your tee shot has to be spot on as pole position is essential to hit the green and not trouble with the second shot. Out of bounds on the left and a large bunker on right. Many a good card murdered on here so you need nerves of steel – not aluminium (check the sponsor!). 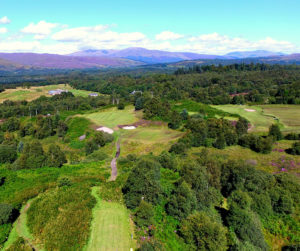 Par 4, left to right slight dogleg fairway, burn on the left, fank on the right, green somewhere at the end, what a beauty. A very open 183-yard par 3 with no trouble within 50 yards of green. Even so this hole has much more than its fair share of dropped shots. One of the shorter par 4s at 284 yards and an expected birdie chance. The tee shot needs to be down the left side to be sure of keeping the ball on the very narrow high elevated green. You need to steam straight down the middle of this long slog. Invariably plays into a strong crosswind that can move your ball into the long rough either side of the fairway. Any derailment here and your cards a goner. Another short birdie chance at 262 yards. The biggest danger is going for the green and ending up in the sea of ferns either side. 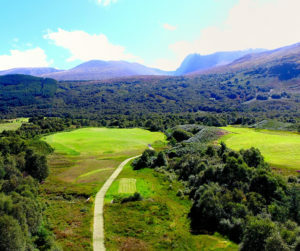 156-yard par 3 across a valley onto a superbly shaped green with some very subtle borrows. 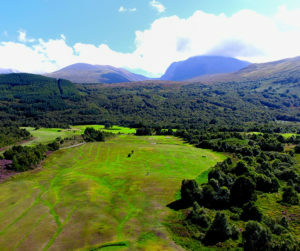 As you walk up this 357-yard par 4 you get another fantastic view at the north face of Ben Nevis. Another receptive green, rewarding the well struck 2nd shot. 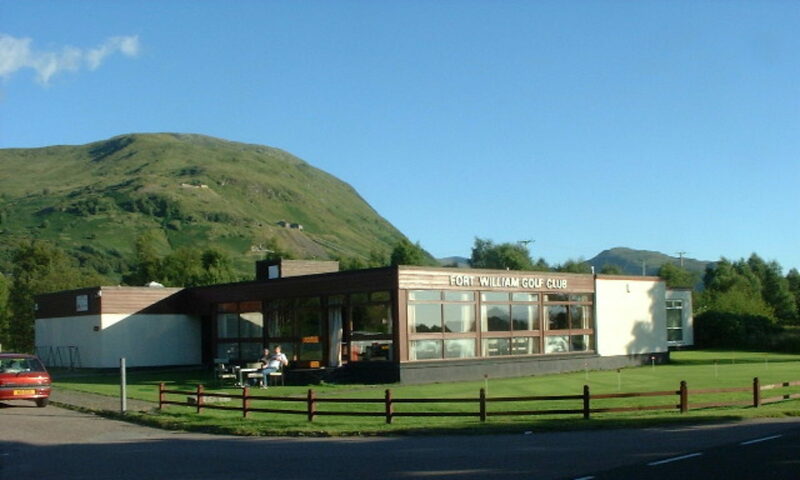 Look out for the ditch about 60yds short of the green and the two bunkers either side waiting for any error. If you have had a bad round the practice area is to the left!! 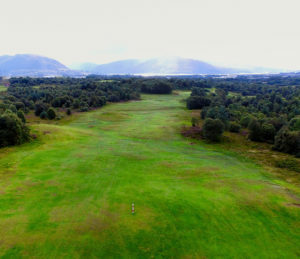 A nice quiet 332yard walk from tee to green down this last fairway. With a ditch across the front of the green and a big bunker on the right, a par should be straightforward. 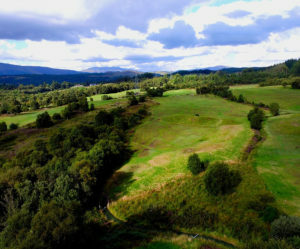 (Look out for the ditch and long rough down the right hand side of the fairway). 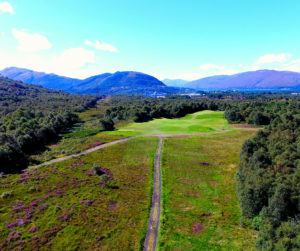 Putt firm, shake hands and we hope you’ve enjoyed your round at Fort William Golf Club, a true Highland course with true highland hospitality. 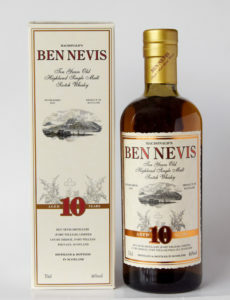 Then it’s off to the 19th for a well earned dram!